The human element and user experience of workplaces was a major theme of NeoCon 2017. Image courtesy of PLASTARC. 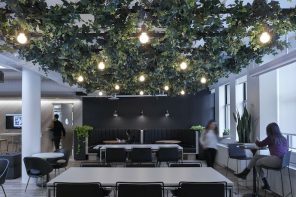 Whether we’re away at a conference or at home in our office, we at PLASTARC tend to view the world of workplace design from a particular perspective: a human-centric one that prioritizes the needs and experiences of occupants and emphasizes the cognitive science behind good design decisions. Naturally, our attendance at NeoCon 2017 gave us a generous serving of food for thought in all of these regards. Below are some of the themes we picked up on in Chicago—served with a side of signature PLASTARC context and perspective. Left and right, we saw designers supporting more integration between disciplines: hospitality, office, residential, educational, and beyond. It used to be that you’d see one showroom devoted to workplace furniture, one focused on hotels, one doing healthcare, etc. This year, not so much. We saw lots of furnishings one could look at and imagine in a variety of settings. Knoll’s Unscripted Sawhorse table and Bertoia Stools, for example, had a glossy black and gold color scheme almost reminiscent of a Las Vegas lounge. The third generation of our client West Elm Workspace’s office products were again greatly influenced by residential touches like wood furniture frames, natural fibers, and multipurpose work surfaces reminiscent of the ubiquitous kitchen table. It all made us wonder what we’ll see next year: will guest room-inspired daybeds or airline sleep pods start populating showrooms as the next generation of furniture built for lives lived in fluid spaces? We also saw more versatility in office furniture and accessories: more products that serve multiple purposes, and/or can be easily lifted, folded up, folded out, or rolled away by the average occupant—no superhero strength required. We’re all about giving employees more control over the stuff they use every day, as it’s been thoroughly proven that having those choices makes people happier, more productive, more engaged, and more creative at work. This typology-blurring observation was consistent with one of the things we at PLASTARC have been documenting and promoting for years: as our workspaces do a better job of serving people’s interests and needs, of stimulating our senses and helping us de-stress, they can shift from being places we have to be paid to go (the case with a traditional office job) to places we pay to go (the case with coworking facilities designed with human well-being in mind). Usual stylized office accessories are replaced with actual circuit boards and soldering irons. Image courtesy of PLASTARC. That techie look. We noticed the aesthetics of tech superseding other styles. For example, Vitra’s showroom in 2016 was a kind of maker jungle, teeming with tools and plants. This year, it was a pure white box, more evocative of a science lab. Even Steelcase got in on the fun, replacing the usual stylized office accessories with actual circuit boards and soldering irons. Join the A/V Club. We heard a Herman Miller IT rep use the analogy “cup holders for tech” to describe the incorporation of audio/video capabilities into workplace furniture and accessories. (We love this phrase: if there’s a spot beside you in the car built for your latte, why shouldn’t there be a charger for your phone built into the conference room table? Tech support has become just as important to worker happiness and productivity as caffeine.) A good example of such furniture/tech integration came from Steelcase’s media:scape, which has been integrating technology into office furniture for several years. There’s (still) an app for that. We saw apps for facilities managers (like Knoll’s collaboration with the anonymous people-counting system Density on an app that measures how groups utilize a space), apps for the self-quantifying workplace occupant (like Physics Toolbox and Moves), and apps for the interface between the two (like Comfy, which gathers employee-contributed data about temperature preferences to inform which areas of an office should be made warmer or cooler). This proliferation of tech on multiple levels points to the increasingly major role technology is playing in work and workplaces today—and to the fact that, while no one knows exactly what skills will be demanded of employees in 50 or 100 years, the work of tomorrow will almost certainly require a mix of “maker” and “digital” abilities. In any case, it was obvious to us that the future is very much on workplace designers’ minds. If we saw one overarching NeoCon 2017 motif, one thread that popped up time and again, one single biggest driver behind our other thematic observations, it would be (drum roll): user experience (UX). Those two little letters covered a lot of ground in Chicago. First, there was UX’s science-y side, represented by a greater focus on factors like acoustics that have a pronounced physiological impact on building occupants, as well as by the amplitude of whitepapers focused on the human and social ideas behind products—not just all the ways said products can be configured. As our work becomes more creative, the contents of our desks and our workplace storage needs both evolve. Image courtesy of PLASTARC. Then there was UX’s experience-y side, represented by an emphasis on personalization: from offering employees modular furniture that they can easily transform to suit their needs, to communal or individual decorating styles (or both), to knowing where the wood in one’s reclaimed wood conference table came from. 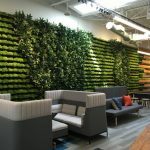 We were glad to see personalization gaining ground at NeoCon, since allowing employees more choices has long been shown to positively impact their mental and physical health at work, and to strengthen bonds of loyalty between employee and employer. This experience-y dimension was also seen in the event’s heightened interactive quality: this year’s NeoCon felt more than ever like a live performance or retail shopping venture where surprises and participatory opportunities waited around every corner, rather than just a furniture expo. This multi-tiered effect began with the activation of the event space itself: TheMART is the world’s largest commercial building and design center, and hosts many manufacturers’ showrooms year-round—but it comes even more alive when 50,000 architecture and design professionals stream in. Because of this, NeoCon has never been the kind of conference attendees go to just to hear lectures. But this year, its exhibitors took its intrinsic level of activation to new heights by providing a slew of DIY activities. Visitors could make an upcycled coin purse from material leftover from a furniture fabrication process, for example, or 3D model a small item and get it printed as a souvenir. Multi-sensory, interactive treats surprised, delighted, and built community amongst showroom visitors. Image courtesy of PLASTARC. Experiences like these have always served business well, as they entice customers to spend more time in the shop (or on the website), teach them about the products on offer, and leave them with a fun and memorable impression of the company or brand. But PLASTARC would like to see such user engagement efforts taken a step or two further: into the workplace, and made year-round. We also think these kinds of playful engagements would do well to be supercharged with information about products’ origins, ingredients, and potential reuses. A conversation about waste or recycling could have accompanied the coin purse project, for instance. Or imagine the possibilities if a large company ordered a thousand new desks, and with them were delivered scraps from the fabricator that employees could use to fashion their own office decor. We think that level of engaging UX would be a lot more fun (plus it would come served with an appetizing side of coveted CSR—corporate social responsibility). As evidence mounts that investing in experiences is a surer route to happiness than focusing on material goods, workplace designers and corporate occupiers alike have the opportunity to make UX their design methodology and choose products that put user experience first.